Let’s take a moment to look back on some of these unforgettable trends from the 2000s. One thing that was extremely popular back in the 2000s was chokers. They added a little bit of edge, or something, to your look. Oddly, everyone seemed to own them. We even saw them on Hilary Duff when she was on the Disney Channel as Lizzie McGuire. Fishnets were the hottest accessory to wear with your denim miniskirt, even when your mom would tell you to stop wearing them. Obviously you’d just sneak them to school in your backpack and change when you got there. These bottoms were the best way to dress up your outfit. They were awkward-looking flowy pants that were worn with literally everything. Although this trend only lasted a few years, it’s one that we’d rather forget! This brand was all the rage back in the day. 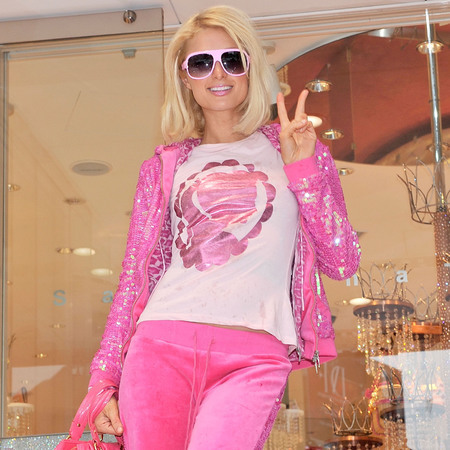 If you had a Juicy Couture sweat suit, it became your signature school uniform. Celebrities wore them everywhere, and they were the comfiest fashion trend around. Yes, you read it right. Back in the day, this used to be a trend. Celebrities would take a short flowy dress and wear it with flared jeans, so we did, too. It’s truly a blessing that this trend never came back into style.